If you have no heart for the holidays, give yourself a gift of light and space. Gentle glowing light. And nothingness, emptiness, silence. Peace. Last year, instead of a Christmas tree to brighten the house, I bought one of those digital frames, loaded it full of my favorite photos, and put in on the counter where the lit tree used to stand. Every five seconds the frame flashed a different picture. Colors splashed all over, lighting the place up like Christmas. It worked so well in lifting my spirits that I kept it plugged in all year. This year, to brighten the upcoming holidays, I’ve been clearing the house out top-to-bottom. I wanted home to look like a scene out of Martha Stewart Living, in holiday-less May. Only more subdued, like a meticulously appointed hotel. I wasn’t going to survive the season with my house full of stuff crushing me. It was time for a major purging. If you were on a desert island and could only have ten things, or if you were getting buried beneath all your belongings and could keep only a fraction of them in order to breathe – what would you hold onto? In the depths of sixteen years’ accumulation, I came across countless photos and precious possessions from my daughter who died. Soccer balls. Stuffed animals. Costumes I’d sewn for the kids and myself. My old tent and sleeping bag. Maps of France. Assorted remnants of my past lives. I found fifteen electronic candles and ten forgotten flameless LED tea lights. The hardest things to let go were the stuffed animals. The squishy-soft polyester puppies and bunnies had glinting plastic eyes that followed me around the house as my helper and I gathered a step-van’s worth of papers, defunct electronics, kitchenware, old luggage, toys, teaching materials, art supplies, and house parts. “Someone else is gonna love this,” I kept reminding myself, as I tossed things in bags. I saved the battery-operated candles, the photos, a cape of pink polka-dot tutu fabric, a bunny garden ornament and six stuffed rabbits. The tea lights. And when the two days of purging were over, when the house was silent and still, I sighed with relief at the almost bare shelves. Something in my soul sang out and danced in the empty spaces as I filled them with electronic light. What do you do when you’ve had your fill of holidays? What do you hold onto in this season? What do you toss? 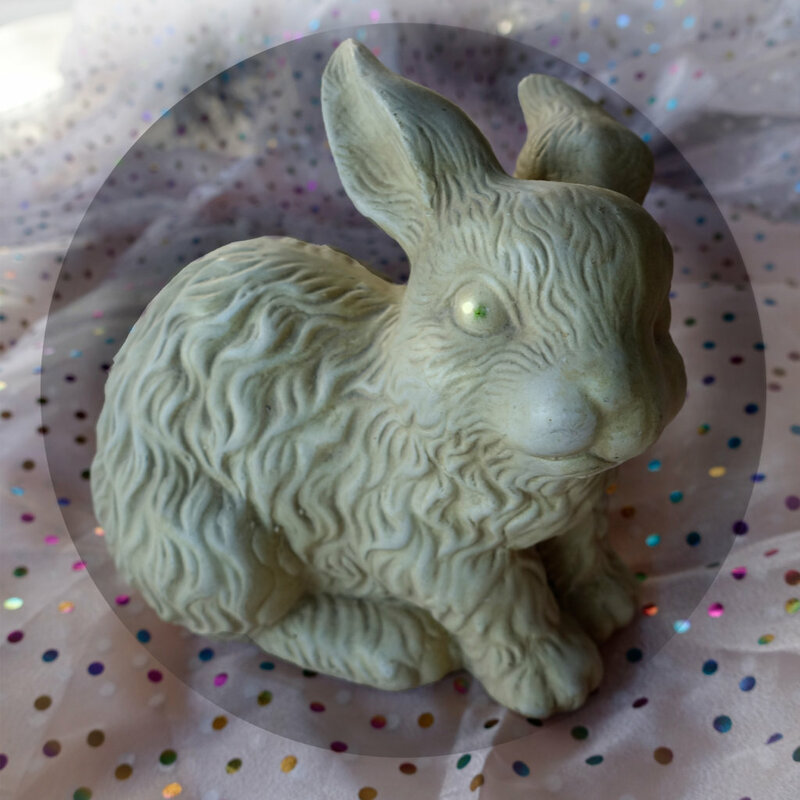 This entry was posted in 2016 and tagged bunny garden ornament, celebrating light, Cleaning House for the Holidays, emptiness, empty shelves, holiday cleaning, keeping stuffed animals from childhood, room to breathe, too much stuff on 2016/12/05 by Robin Botie. Good idea, Robin. I remind myself that in the end it all has to be left behind, including my body. I’m in the middle of sorting and clearing in a big way, but–still in the middle. I’m on the two year plan. I want the photos (may I choose all of them? ), my dream notebooks, my computer, a few treasures. The rest can be replaced. Your shining house would inspire me. I’m slow since I don’t stick with the job but keep returning to write or read one more thing. Elaine, reminding myself that “in the end it all has to be left behind” is something I haven’t tried yet. I bet that does work “in a big way.” I mean, I might end up giving away the house and the dog and everything if I keep that line in my head. Well, I have to admit – it’s been less than two weeks and my house is beginning to fill up again. It’s the gifts. Some people refused to believe that I didn’t want gifts that I couldn’t eat. So now I’m trying to integrate more towels, a cutting board, an Italian hand-painted bowl, more books, more clothes, and more into what I already have neatly arranged on my shelves. I have the same problem, so I got specific with my son and his wife. They came through with a gift certificate for a massage, delicious and beautiful jams and pickles from their garden, and a few tiny, tiny other things that will get used. We can do this! Good job! I’m proud of you! And, reading this was an inspiration to me… kids come home from college next week & I want to enjoy them, not be stressed w/ ALL the stuff ALL around the house. Thank you, ka. I agree: when the kids come home it’s time to stop and enjoy them. Even if they’re flying outta the house right away to catch up with their friends, just the fresh whooshing air that follows them and charges up a whole home is worth simply sitting back and taking in. When they leave again there’ll be time for cleaning and caring for the house. The whole cleaning thing, really, is a supreme grief dance. A cleansing, a purging, a frantic effort to set things right. I wish you a stress-free beautiful time with your returning kids.